So I factory reset my LG G Watch R and then tried to set it up my with new Note 4 but I couldn't get it to pair with the Android Wear app. I messed around with it and found the setting by pressing the crown in for a few seconds. There is a setting for bluetooth, but when I select it all it says is Bluetooth is currently disabled. There is no option to turn it on. I have tried factory resetting. Just rebooting it. Letting the battery completely die. But nothing works. Right now my $300 smartwatch doesn't do anything. I have exactly the same problem. I even sent it to LG repair under warranty here in Sydney Australia and it has come back exactly the same. Anyone know how do you enable bluetooth on the LG Gear watch R? As I can't use it now. Did reset to the watch and after that no phone can see it. Tried with One M7 (rooted, customer ROM), Galaxy S3 (unrooted, Stock ROM) both just won't find the watch by bluetooth. I updated the watch via ADB to 5.01 hoping it would solve the porblem but no. Still the same, both phones can't see the watch..
That is exactly the problem with mine. I even sent it to LG repair centre in Sydney as per their request via a call to support. They claim they flashed it but it is exactly as it was when I sent it to them.. No way of enabling Bluetooth and 4 Bluetooth devices cannot see it when they used to be able to. The watch is now useless as I can't use it. Well I have an update. I honestly don't know what has changed...but my watch works again. Having the occasional connection lost problem as reported by many in the new 5.0 update in the watch but nothing too serious. Anyway, reset your watch. Forget the watch in the Android wear app (or delete data and clear cache), but also delete the paired watch from the phones bluetooth menu. ( BTW: I deleted all my paired devices in the phones bluetooth menu and then paired the watch first, don't know if this affected or not, if all else fails you can try this also). Then turn off bluetooth from your phone. 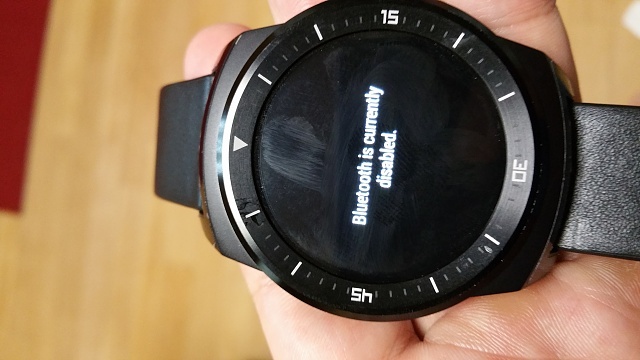 Start Android wear app and let it turn on bluetooth. THis way I can pair my phone. Whenever the watch loses connection to the phone and doesn't reconnect toggle bluetooth off and on from the phone and it works again. Why am I getting the error message Another app is using microphone and it's terminated now on my HTC One M7?